Did Egypt’s Muslim Brotherhood bite more than it can chew when it fielded its own kingmaker Khairat el-Shater to run for president in May, reversing an earlier pledge to stay out of the race? Only time will tell if it did. But the contentious decision has already raised eyebrows everywhere as well as alarms both at home and abroad. The decision to field Shater, deputy Supreme Guide of the Brotherhood and a prominent businessman, was taken by a close 56-52 vote in the Shura Council, the organization’s second highest decision making body. When the Brotherhood assured the public in spring 2011 that it won’t run anyone for president it was confident its political arm, the Freedom and Justice Party, would win a commanding victory in the legislative polls, which it did in December. As if to stress the point, the Brotherhood threatened members with expulsion if they ran, or supported anyone who would run, for the highest executive office in the country. The Islamist vote for president is already split among three main Islamist candidates: Mohammed Selim El-Awa, who is close to the Brotherhood, Salafist preacher Hazem Salah Abu-Ismail and Abdelmoneim Abul-Fotouh, who was booted out of the Brotherhood for announcing he would run for president before the group changed tack. 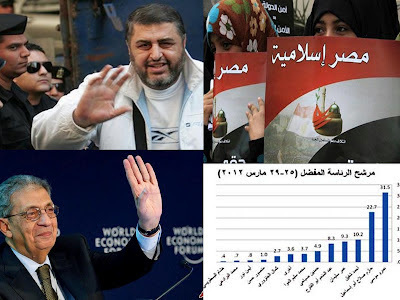 A pubic opinion poll published today in Egypt’s leading daily al-Ahram shows one-time foreign minister and former secretary-general of the Arab League Amr Moussa remains the frontrunner in the upcoming presidential ballot, followed by Salafist Abu-Ismail. The poll was based on interviews with a random sample of 1,200 adults across Egypt between 25 and 29 March 2011. Among those polled, 31.5 percent said they favored Moussa for president, followed by 22.7 percent for Abu-Ismail. Dr Mohammed Abdel Salam, of the Ahram Center for Political and Strategic Studies (ACPSS) tells Arab electronic newspaper Elaph in remarks published today Shater’s candidacy shows the Brotherhood trying to gain control of all key state institutions and become the country’s political hegemon. By joining the fray, says Abdel Salam, Shater will be hurting Abu-Ismail and Abul-Futouh’s chances and boosting those of Amr Moussa and former prime minister Ahmad Shafiq. “The split will take long years to mend… Egypt would be better served if the incoming president were non-Islamist, or at least not specifically from Brotherhood ranks.